Why does everyone love the Arbutus Tree? Also known as the Madrone or Madrona tree, it is easily my Favorite Tree. It has so many unique and special qualities that I love! 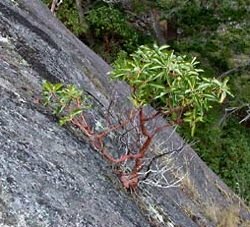 A magnificent yet fiercely rugged tree, Arbutus shows its fullest beauty while clinging to rocky bluffs and crags overlooking the ocean. It can be over one hundred feet tall and giants can be as wide as ten feet in diameter. These beauties can live to 500 years. 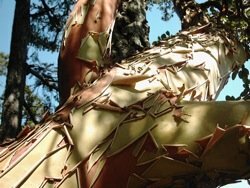 Arbutus trees have the ability to survive the harshest climates close to the sea: wet and windy with snow in the winter and dry parched in the hot coastal summers of the Pacific Northwest sun belt. They can grow on bluffs where there is very little soil and survive droughts in several ways. One is by creating burls that store water for release when needed. 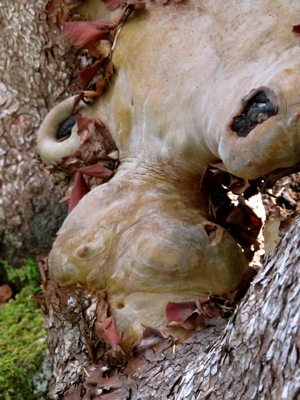 In fact, burls can grow not only on the base of the tree near the ground but higher up the tree as well! They also survive the worst of droughts by letting a branch or part of a branch slowly die off or even a portion of the main trunk so that the tree can live. That way they can survive when all others would die. You can see these dead branches on many trees. 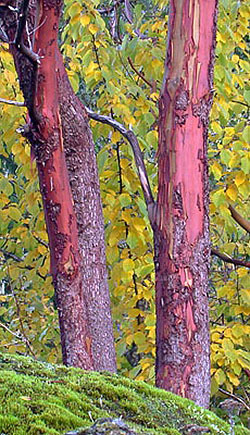 The Arbutus tree, also known as the Madrone tree or Madrona tree, technically is called Arbutus Menziesii. Sometimes it is referred to as Oregon Laurel or Laurelwood. 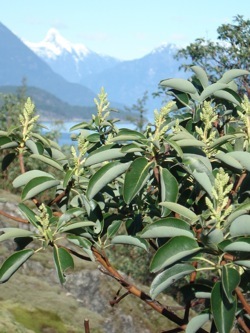 Canadians seem to prefer Arbutus while Americans call it Madrone or Madrona. It is one of the most amazing trees of the Pacific northwest and certainly tops the list of favorite trees, along with the Manzanita tree (actually it is a bush) and Yew trees. Arbutus Menziesii Cultivars is the name given to cultivated varieties in Europe prized for the Arbutus flowers they produce. Arbutus Unedo Compacta is a variety of Arbutus that also grows in Europe and is actually a bush much like the Manzanita tree here on the Pacific coast. This variety is also known as the Arbutus Strawberry Tree or the Trailing Arbutus because of its red berries. The Arbutus flowers on them are very similar to the Arbutus flowers found on the Arbutus tree. 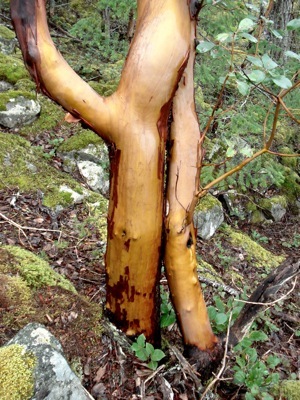 The Arbutus tree or Madrone tree makes its crooked shapes because of how it has to cling to the rough terrain, rocks and fissures and also how it searches for sunlight bending around other trees or searching for optimum light exposure. They love hanging out (literally :) on moss covered rocky bluffs above the ocean! They grow horizontally and every which way! Here is an amazing feature: their leaves are unique in Canada. Arbutus is the only deciduous tree (ones with leaves) that does not loose its leaves in the winter! It is like an evergreen tree with leaves instead of needles, unlike the evergreen trees such as pines and spruces. What happens is that in the early summer, new leaves grow and the old ones then fall off but the tree is never ever bare of leaves! It always has leaves. In the early spring, Arbutis forms bountiful white blossoms (especially if surviving a previous summer's harsh dry spell...the blossoms are a survival tactic). Each Arbutus flower or blossom makes the tree even more spectacular. And oh what a delicious perfumed scent the Arbutus flowers release! And do the bees ever love those blossoms. 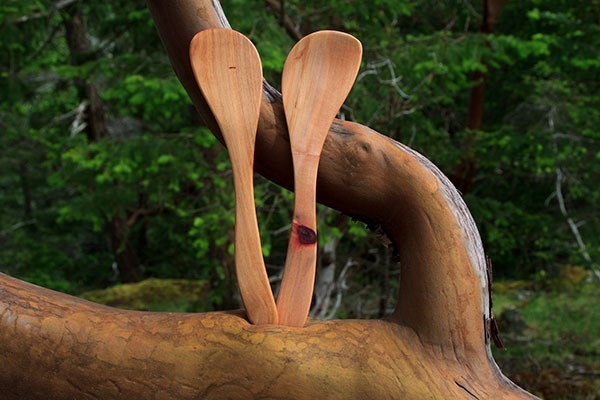 In fact, Madrone trees are an important source of honey for commercial beekeepers. 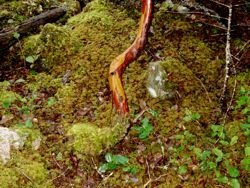 In the summer, the reddish brown bark sheds its skin just like a snake! 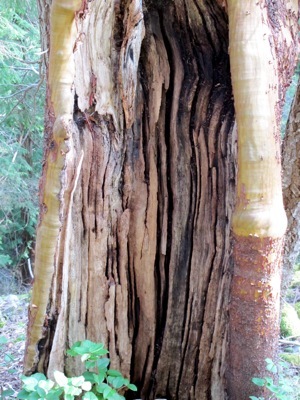 The bark is thin and smooth, peeling in thin flakes or strips to expose younger, smooth, yellowish green bark underneath that turns reddish again in the colder winter. In fact I sometimes call it a snake tree! 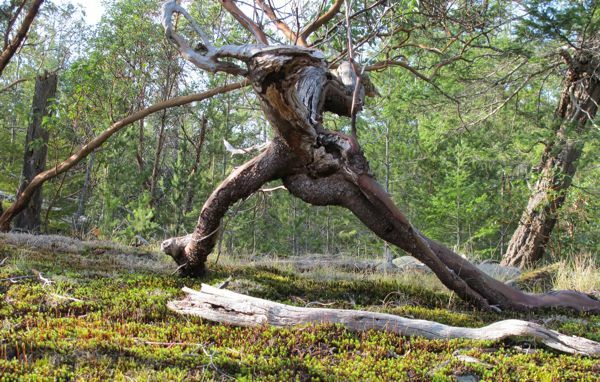 Not only because of its bark shedding but also its ability to wind its way through cracks and crevices and around other trees as it seeks sunlight. The new bark is as smooth as a smooth can be! It is one of the features that makes the tree so sensual and a favorite tree to so many admirers. In the fall, the spring blossoms have turned into clusters of orange red berries that feed the birds and deer. Perhaps my favorite quality of the Arbutus tree is the vast array of shapes and contours they can take. 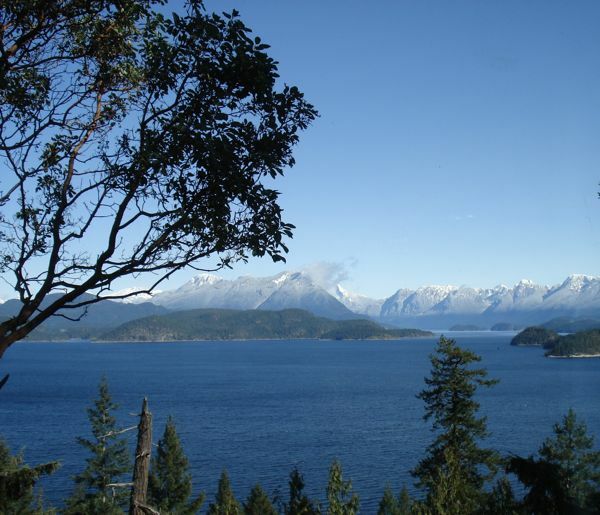 They can grow tall and straight in open Arbutus forest groves with good soil and lots of sunlight but everywhere else they take on dramatic postures that vary from tree to tree especially on bluffs and exposed areas overlooking the ocean. In fact they mostly grow within 5 km (3 miles) of the sea, but sometimes can be found beyond that limit. Another fascinating characteristic of the tree that helps it survive is that it can rejuvenate and re-grow even after falling down! New shoots sprout up from the base. Cut a branch off and it will sprout a new baby limb! One danger is that the new shoots' leaves are delicious for deer but the sprouting limbs do seem to be able to keep ahead of the nibbling! They are tough trees and the wood can be the hardest of hardwoods. Another special feature of Arbutus trees comes to light only in the rain. When the bark gets wet, it glistens and shimmers as though recently waxed to a high sheen. The smooth bark makes the water on it dance with glee! So even in the most miserable weather of the wet coast, Arbutus brings joy to the beholder. 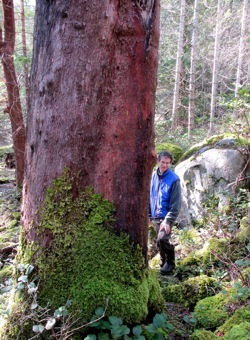 You will never get bored searching out unique Arbutus trees. Its mysterious and exotic nature will always thrill! In summary, the Arbutus tree captures the imagination and shows so many unique characteristics as to make it the winner as my favorite tree. To top off this achievement, the wood inside is so spectacular as to also be my favorite wood! 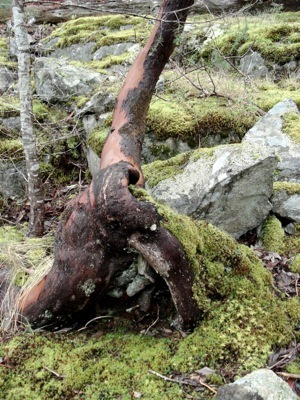 This is a dancing Arbutus hiding out on the bluffs! And below a few more neat pictures! ... if you have to live as an Arbutus tree, might as well have a nice view! Over the last 3 years I've made several custom slingshots from deadwood madrona forks I've found around Seattle parks. I promise to use it only to send you Arbutus Arts Newsletter. All contents COPYRIGHT © 2018 by ArbutusArts.com.